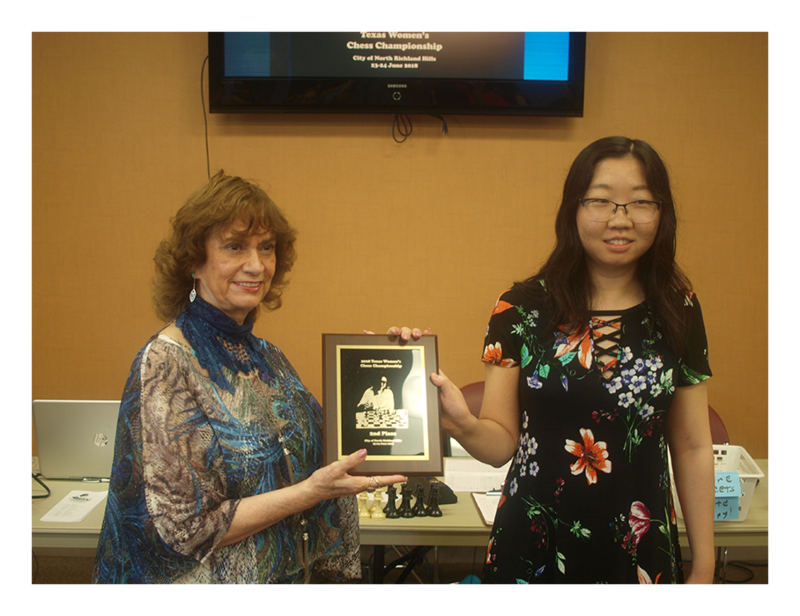 "2018 Texas Women's Chess Champion"
award and title to WFM Devina Devagharan (right in photo). (North Richland Hills, TX, 24 June 2018). Woman FIDE Master and National Chess Expert Devina Devagharan scored 3-1/2 out of 4 points to take clear first at the 2018 Texas Women’s Chess Championship. 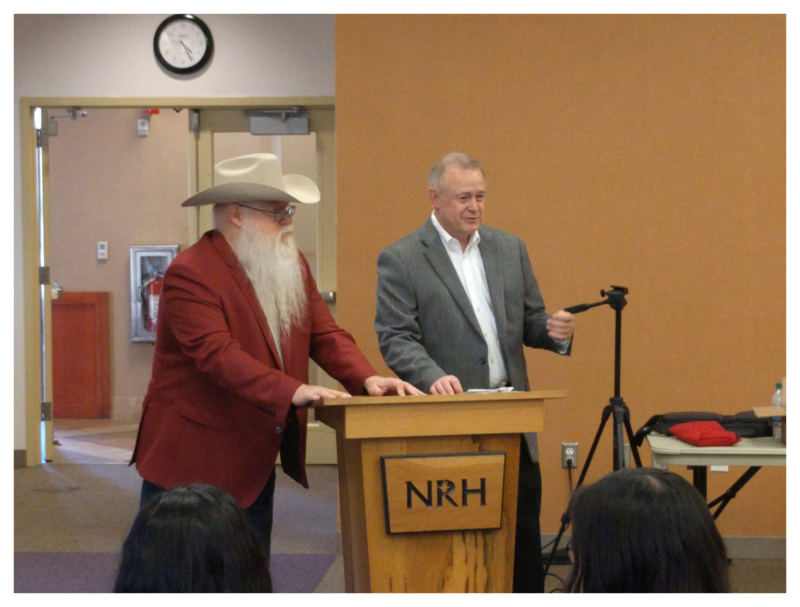 The Championship was conducted in the North Richland Hills Library during the weekend of 23-24 June 2018. WFM Devagharan plays at the Arlington Chess Club, is from Euless, has a peak US Chess rating of 2174, and is ranked Number 40 for all USA women. Yue Chu, from Plano, scored 3 points and finished in 2nd Place on tiebreaks (right in photo). She has a peak US Chess rating of 1976 and is President of the University of Texas at Austin Chess Club. She is also a Club Director. 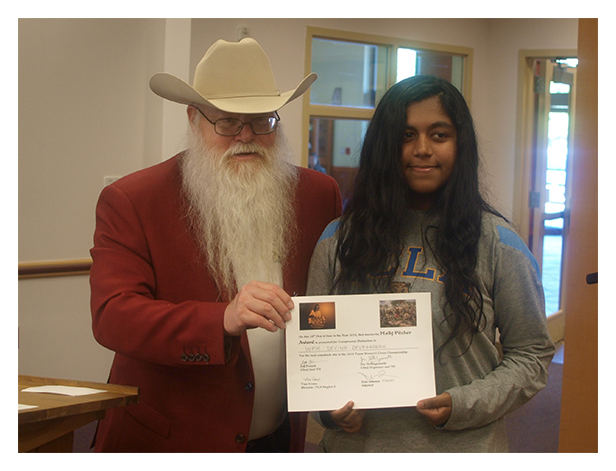 Marita Del Rio Sumner (left in photo) presented her award. Ambriette Reed (right in photo) scored 3 points and was crowned "2018 Texas Women's Novice Chess Champion". Ms. Reed is from Roanoke and ranked Number 57 for USA girls age 17. She is the Alliance Chess Club Treasurer, Founding President of the Eaton High School Chess Club (2016 - 2017) and is a Club Tournament Director. 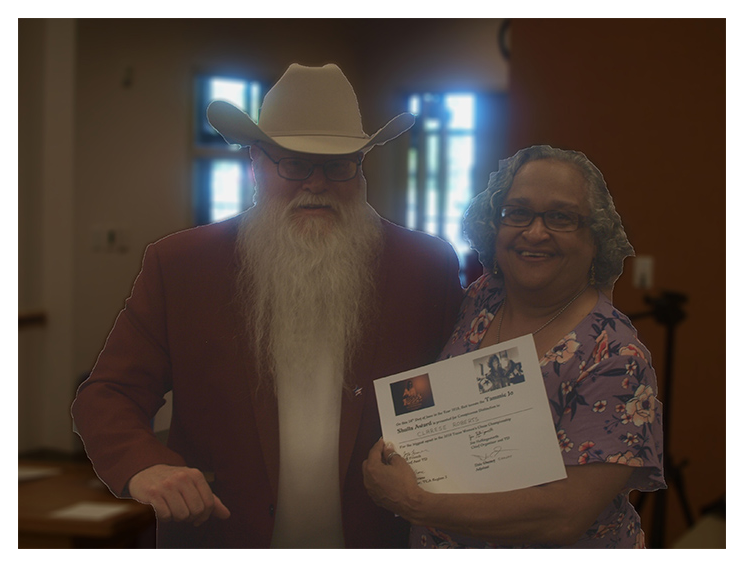 Maritta Del Rio Sumner (left in photo) presented Ambriette’s prize and title. The two-day rated event was sanctioned by the US Chess Federation and the Texas Chess Association. Serious Chess Players, based out of Bedford’s American Legion Post 379, was the sponsoring affiliate. 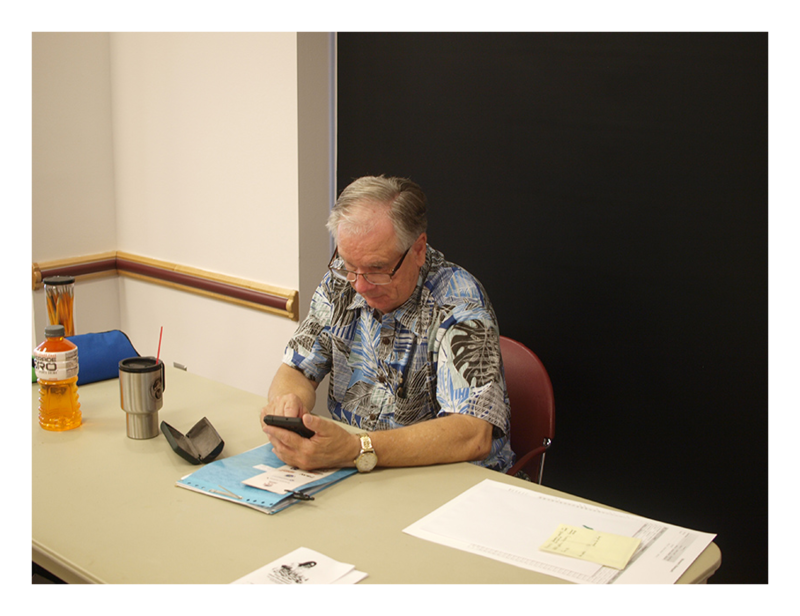 Jim Hollingsworth was the Chief Organizer and Tournament Director and was capably assisted by the Championship’s Adjutant, Dale Chaney (in the photo) and several tournament directors and volunteers. Texas Knights Editor Jeff French was the Chief Assistant Tournament Director. Floor Tournament Directors were two Texas Chess Association Directors, Tom Crane and Woman Candidate Master Claudia Munoz. Jeff French, Tom Crane and Alliance Chess Club President Louis Reed provided outstanding photography support (over 1.3 gigabytes of photos). Louis Reed also designed the Awards Ceremony layout. Alliance Chess Club Vice President Wendy Reed (in the photo) played in the Championship. She is also an artist who uses knitting needles as brushes and yarn as her canvas. 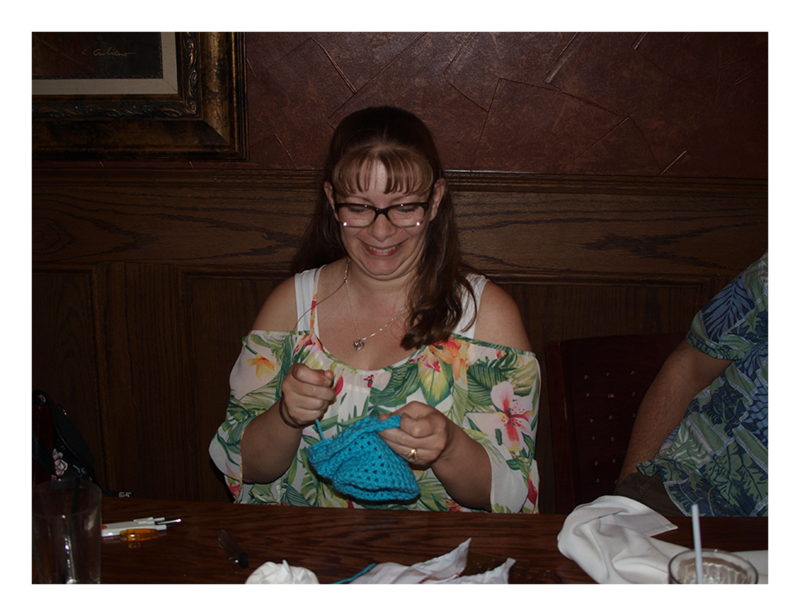 Her husband, Louis, observed and commented “Wendy plays better when she knits during her games!” She generously donated her handcrafted artwork as gifts for all the players and guest speakers. 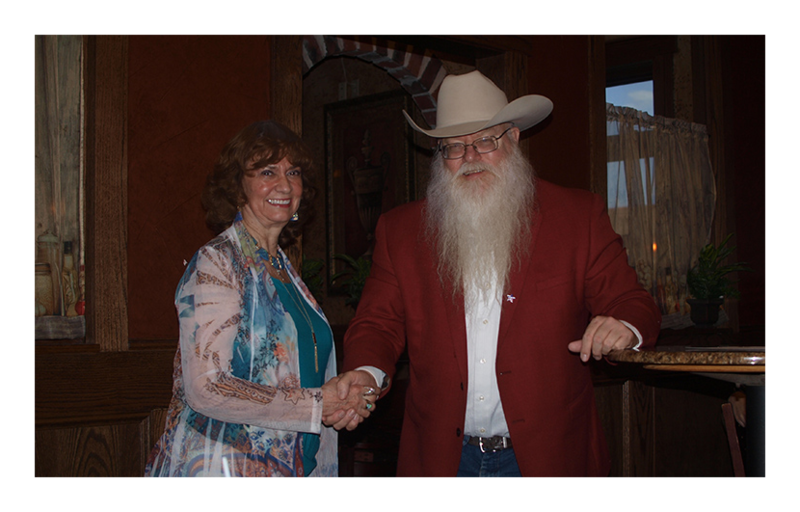 Barb Swafford (right in the photo) received the "2018 Texas Women’s Unrated Champion" award and title from Maritta Del Roi Sumner. Ms. Swafford scored 1-1/2 points and is from Crowley. She is our long-serving Texas Chess Association Treasurer and is Secretary/Treasurer of the Dallas Chess Club. She is also a sponsor and strong supporter for Texas Women’s Chess. The US Chess Federation has roughly 91,000 active members. The lion’s share, nearly 12,000, are Texans. The 2018 Texas Women’s Chess Championship is a small but important slice of this pie. 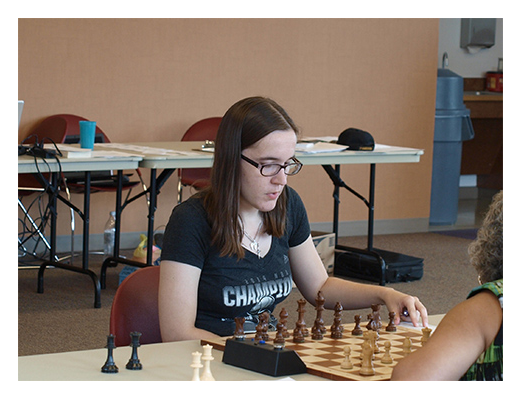 12 players competed in this Championship, at the North Richland Hills Library, during the weekend of 23-24 June and made history. The record of 13 was almost broken, but a few players backed out due to other commitments. Of the 12, at least eight are hardworking volunteers active in developing scholastic, youth and college chess players. Four are age 21 or younger with demonstrated leadership qualities. Three have International titles and are ranked among the strongest chess players in our Nation (irrespective of gender). Two are Texas Chess Team members. One is a prolific chess journalist and author of numerous chess books. One is a retired Marine Corps Non-Commissioned Officer who faithfully served our Nation. One is a recent college graduate with a bachelor’s degree in Statistics. All are from different backgrounds with a love of chess as their unifying bond. Seated (left to right) are Margaret Bailon-Labednick (from Corpus Christi), Wendy Reed (from Roanoke), Clarese Roberts (from Fort Worth), Woman International Master and National Chess Master Dr. Alexey Root (from Denton), and Sheba Basepogu (from Allen). Standing (from left to right) are Woman Candidate Master Camille Kao (from Austin), Nicole Niemi (from Garland), Ambriette Reed (from Roanoke), Yue Chu (from Plano), Woman FIDE Master and National Chess Expert Devina Devagharan, Rheanna English (from San Antonio), and Barb Swafford (from Crowley). The Championship featured an outstanding display of skill and sportsmanship, but it wasn’t all about chess. Motivational woman speakers with uplifting messages were recruited for the opening ceremony, the Women’s Banquet, and the closing ceremony. These women are achievers who overcame adversity. They are role models and offered mentorship for the younger players at a crossroads for determining their life journey. They also validated the sacrifices and experiences of the older players. “So, I made the change. I needed courage. My husband and family supported and encouraged me. But, the decision was mine alone. And I have no regrets. I love what I do. I love talking with clients and assisting them with their investing needs.” She added, “I treat my clients like I would want to be treated.” Today, Ms. Oujeskey is Vice-President for Investments at Raymond James & Associates, Inc. 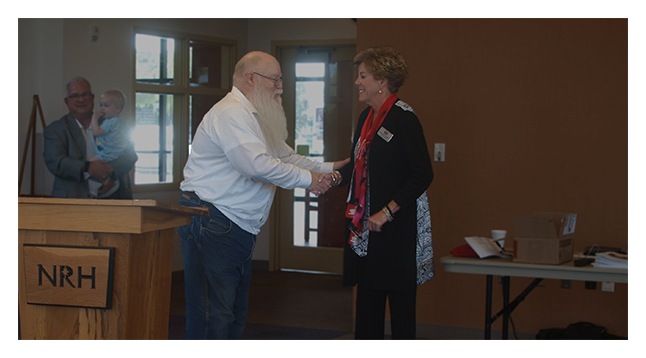 The Birdville Independent School District and North Richland Hills community benefited greatly from her volunteer work and leadership. She served on numerous boards and commissions. One day, the Mayor asked her to serve on the City Council. “This was another decision that took courage. This was entirely new to me. It was a challenge and I accepted the challenge.” Ms. Oujesky has served on the City Council since 2012 and was Mayor Pro Tem from 2014 to 2015. 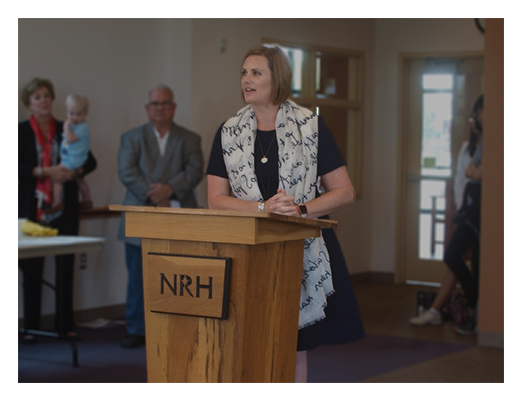 Courtney Kincaid, Assistant Library Director for North Richland Hills (in the photo), also welcomed the players, their families and the tournament staff. Her career journey began when she was an English Major at Tarlton State. She started as a work-study student in the school’s library and loved it. 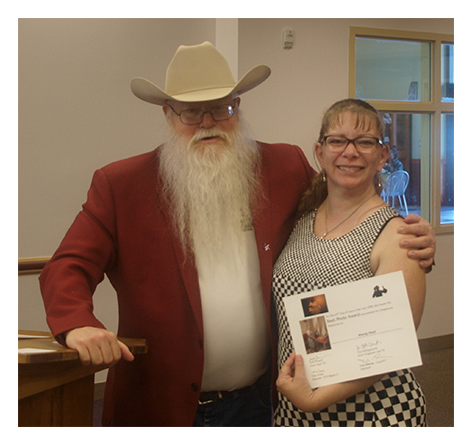 In 2015 she won the “I love my Librarian” award while working in the City of Granbury Library. In 2016, she was “Honorable Mention” for the National Council of Teachers of English’s National Intellectual Freedom Award. Ms. Kincaid is also an office holder for many civic and professional organizations. The North Richland Hills Library is a major hub for organized chess in Tarrant County. In addition to “special” championships, it hosts monthly rated chess tournaments and a weekly scholastic chess club. “We strongly believe in the importance of the game of chess. Chess teaches logic, the importance of detail, discipline, understanding difficult concepts, and collaboration.” Said Ms. Kincaid. 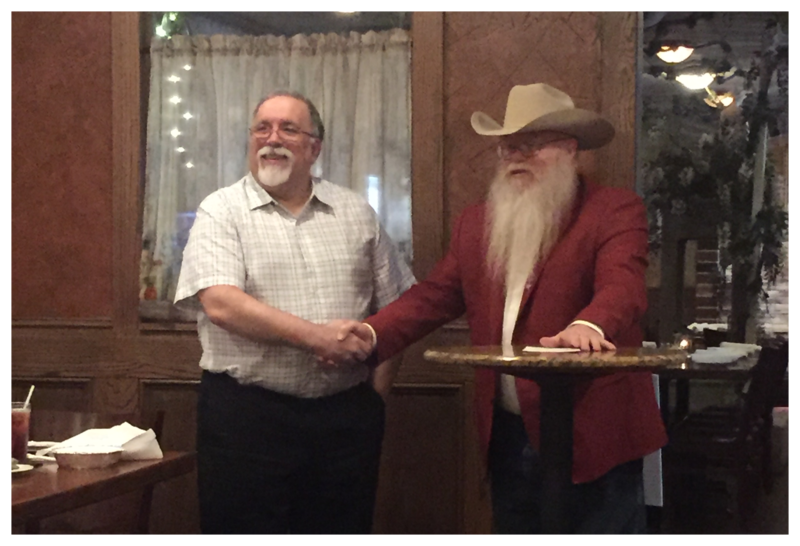 Jim Hollingsworth (left in the photo) introduced Woman Candidate Master and National Chess Expert Claudia Munez (right in the photo) at the Women’s Banquet. 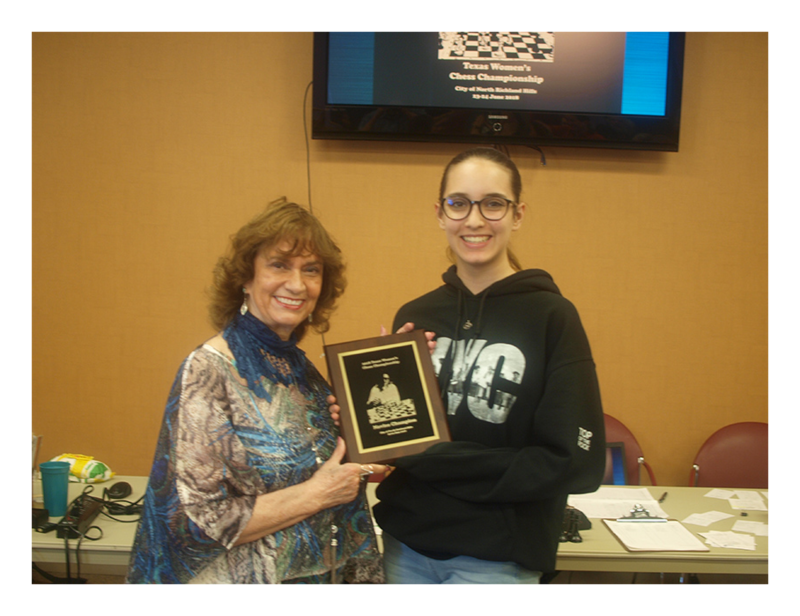 WCM Munoz was an organizer for the 2018 Texas Women’s Chess Championship. She is also TCA Region 1 Director and an honors Mathematics student at Texas Tech University. She manages several chess camps sponsored by the University. Ms. Munoz adjusted her schedule to attend the Women’s Banquet and volunteered to be a Floor TD for one day before heading back to Lubbock and run another chess camp. 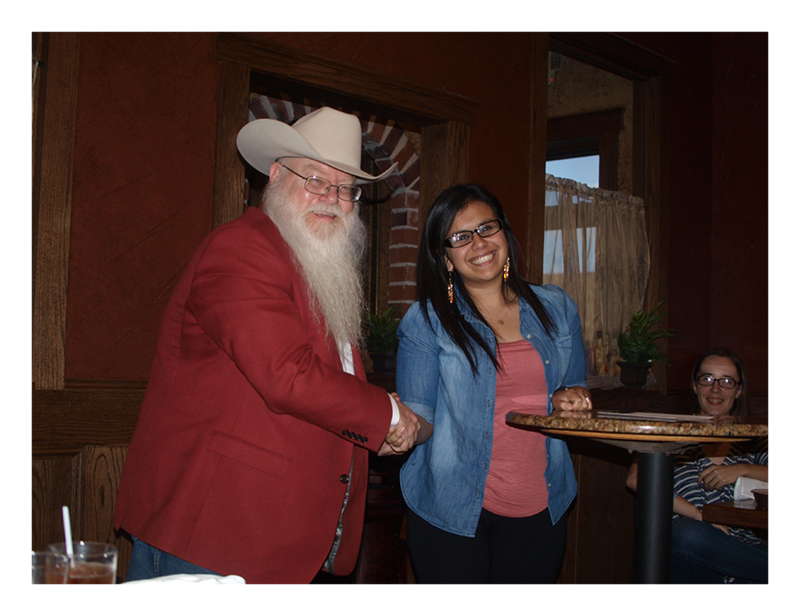 At the Women’s Banquet WCM Munoz talked about the Texas Tech Chess Program and her experience helping US Chess President Mike Hoffpauir run the NATO Championship in early June. In recent years, Texas Tech has done well in the “College Final Four” and WCM Munoz is Captain of the Texas Tech Women’s Chess Team. The keynote speaker at the Women’s Banquet was Maritta Del Rio Sumner (left in the photo and being introduced by Jim Hollingsworth). Ms. Sumner has one doctoral degree and two master’s degrees. She is a Registered Nurse with advanced certifications. She is also a retired US Air Force Colonel and the President and CEO of Sumco, LP, manufacturing highly developed/engineered specialty products for gas and oil exploration industry. She is a Board Member for the Air Power Foundation. Maritta Del Rio Sumner's message for all was uplifting; inspirational for younger players at an important crossroads and validated the life journeys of older players and staff. Hers is a story of what can be achieved when you set your mind to it. She described her childhood and an early life of instability. As a 7th grader, she made a promise to herself that she would work hard and earn a scholarship to any college she chose. And she did. Her important advice was "Be punctual. Be reliable. And be accountable." On Sunday, Maritta Del Rio Sumner returned to the Championship and presented the top awards. Heart of Texas Award Ceremony. From Left to right: Jeff French, Assistant TD; Jim Hollingsworth, Chief Organizer and TD; WCM Claudia Munoz, TCA Region 1 Director; Tom Crane, TCA Region 2 Director; Barb Swafford, Honoree; Rheanna English (seated). 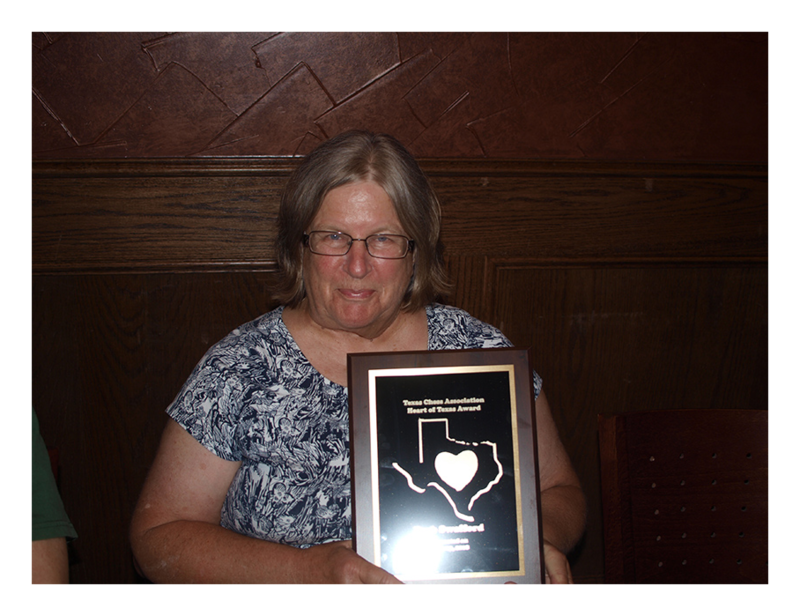 During the Saturday evening Women’s Banquet, held in conjunction with the Championship, Barb Swafford (in the photo) received the Texas Chess Association's "Heart of Texas Award" for her many years of selfless service. 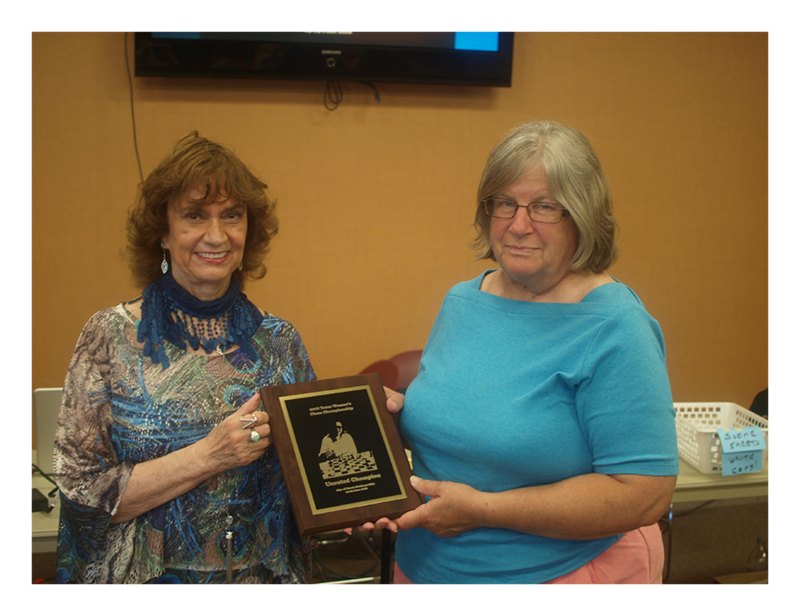 Ms. Swafford is our long-serving Texas Chess Association Treasurer and is Secretary/Treasurer of the Dallas Chess Club. Thousands of Texas scholastic and youth chess players proudly display trophies in their homes that were personally assembled and delivered to tournament directors by Barb Swafford. Midway through the final round, Jim Hollingsworth quietly passed a 3x5 card to Jeff French with these words “If there’s going to be an upset, Clarese is the one to do it!” About 20 minutes later Jim’s prophesy came true. Was it a magic crystal ball or was it his knowledge of Clarese Roberts because she is his best student at the Fort Worth Veterans Chess Club? Whatever, she received the Tammie Jo Shults Award for biggest upset (in the photo with Jim Hollingsworth). 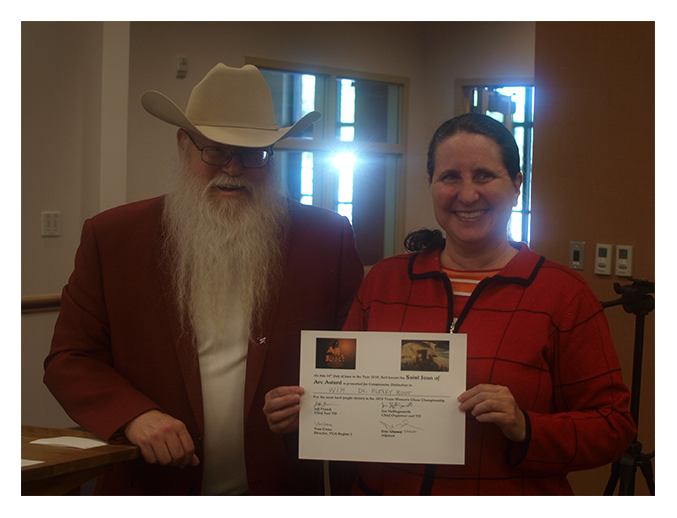 Ms. Roberts is from Fort Worth and is a retired US Air Force veteran and Marine. 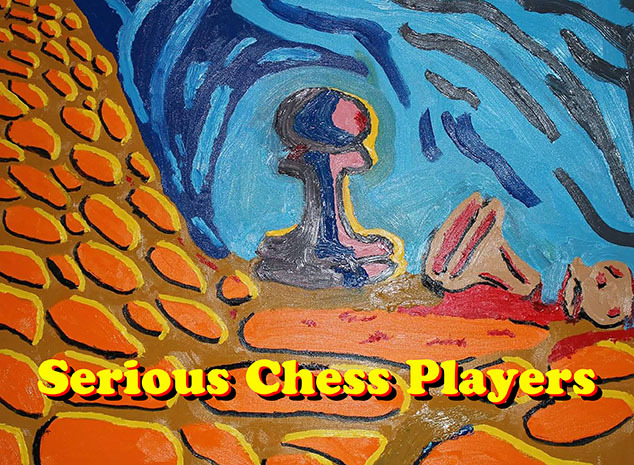 She is the most active member of the Fort Worth Veterans Chess Club. This was her first rated tournament. The Saint Joan of Arc Award (for most hard-fought victory) was presented to Woman International Master and National Chess Master Dr. Alexey Root (in the photo with Jim Hollingsworth). WIM Root won the U.S. Women’s Chess Championship in 1989. WIM Root also earned her Ph.D. in education from UCLA in 1999. Since the fall of 1999, she has been a lecturer at The University of Texas at Dallas, teaching online courses about chess in education. She is the author of several chess-related books. Wendy Reed (in the photo with Jim Hollingsworth) won the Best Photo Award for wearing a “chess dress” with one black shoe and one white shoe while standing next to a chess board. Ms. Reed is a Club Director and Co-Founder/Vice President of the Alliance Chess Club. 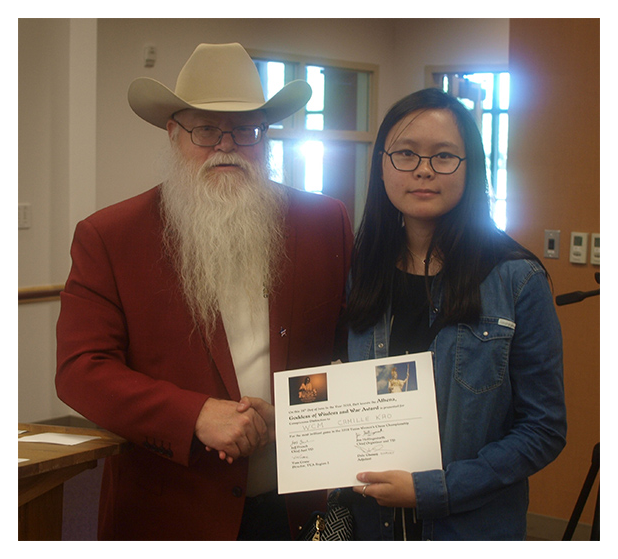 The Athena, Goddess of Wisdom and War Award (for most brilliant game) was presented to Woman Candidate Master and National Chess Expert Camille Kao (in the photo with Jim Hollingsworth). WCM Kao is from Austin, has a peak rating of 2024 and is ranked Number 70 for all USA women. The Games Judge remarked how their game featured tremendous pressure on the eventual winner who was on the ropes early and came back to win. Jim Hollingsworth (left in the photo) presented the well-deserved Molly Pitcher Award (for best comeback win) to Woman FIDE Master and National Chess Expert Devina Devagharan (right in the photo). Chief Assistant Tournament Director Jeff French should have been in this next photo, but he was the photographer and unprepared for what happened next. Every player autographed the Championship Poster as a parting gift and memento. The poster now hangs in Jeff’s home. 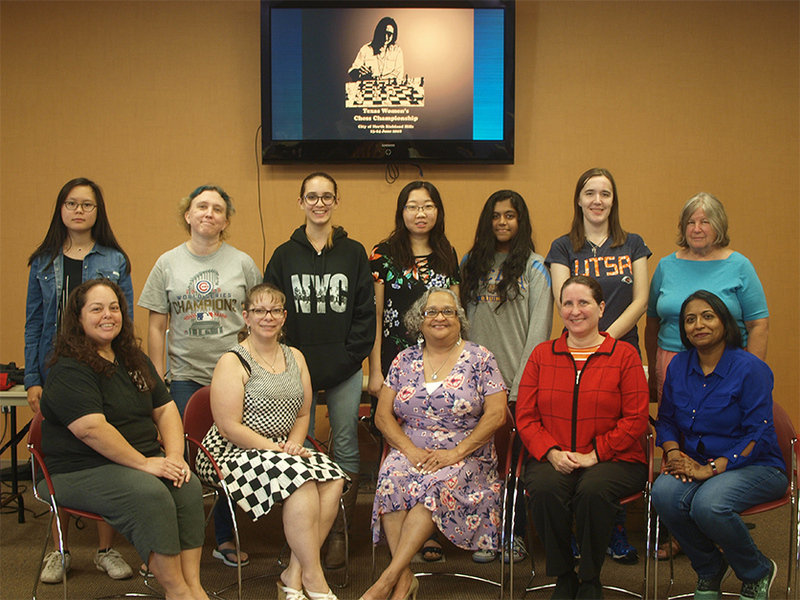 “The Texas Women’s Chess Championship was competed June 23-24, 2018 at the North Richland Hills Public Library. 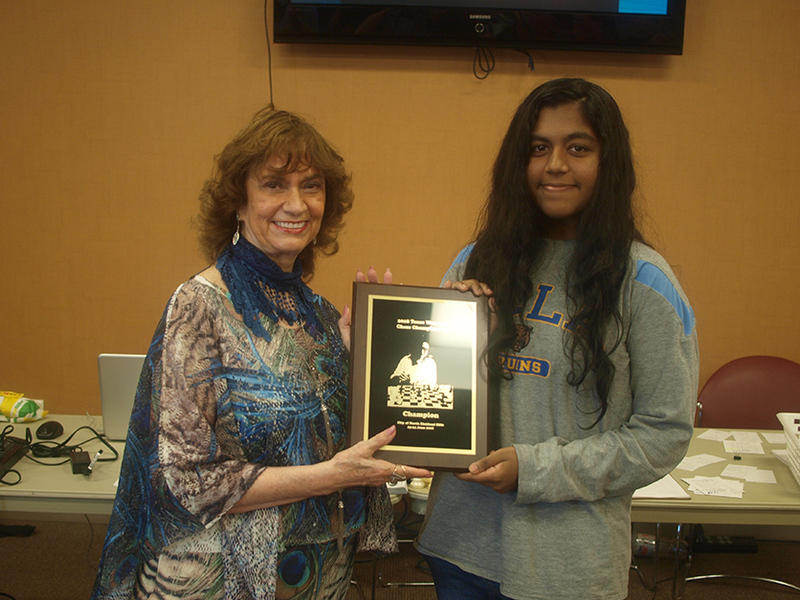 The Library has been a longtime supporter of chess hosting the monthly Tarrant County Chess Club events as well as special events such as the Women’s Championship this year, and the Texas Armed Forces and Veterans Championship last year. 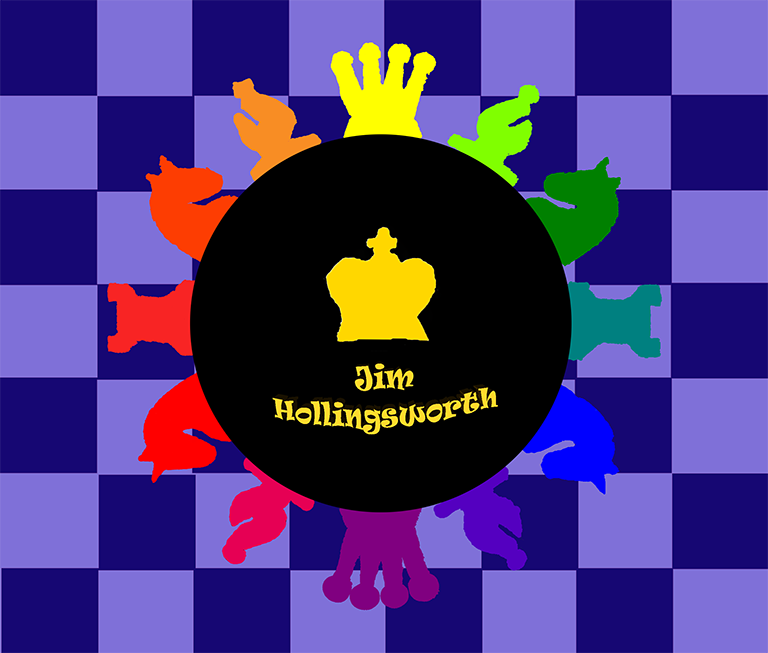 Additionally, the Children’s Services Department has run a weekly Children’s Chess Program every Tuesday afternoon since May 2005. Anybody that knows anything about organizing chess tournaments will tell you having a hosting facility is everything and the Library hosting this year’s Women’s Championship and our other events is sincerely appreciated." The organizers are extremely grateful to all who helped make this Championship possible, especially three anonymous donors, the players, the TD staff, the guest speakers, the NRH Library staff, the Management and staff of Niki’s restaurant, and the friendly staff of Fedex in Hurst. 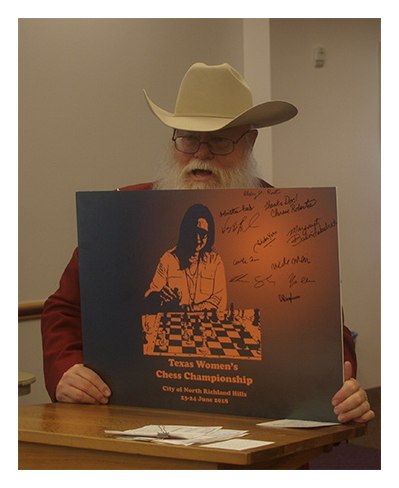 The Texas Chess Association and five local chess clubs gave tremendous support for this epic Championship event: Alliance Chess Club, Arlington Chess Club, Fort Worth Veterans Chess Club, Tarrant County Chess Club, and Serious Chess Players (American Legion Post 379 in Bedford). This Championship was fully funded by generous donors and sponsors through the Texas Chess Association, a 501(c)3 organization. The Arlington Chess Club loaned the beautiful boards and sets. Ms. Josie Bailon, from Corpus Christie, volunteered to make an emergency run to an office supply store. All photos in this article are by Jeff French unless otherwise stated. "Sometimes you just have to take the bull by the tail and face the situation."